I’ve been lucky enough to travel across this great culinary focused region numerous times and each time I discover a new favourite in each corner. 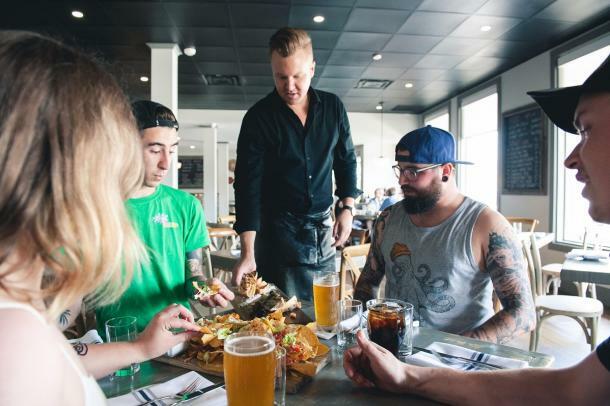 The list of all the amazing places is too long to list so here are 10 tasty locales to get you started on a flavourful discovery across Ontario’s Southwest. The brand new Bistro 42 at North 42 Degree Estate Winery is definitely a must visit spot in EPIC Wine Country. On each visit, you’ll experience fabulous southern hospitality mixed with the amazing farm to table creations of a talented culinary team that sources ingredients from local farmers across Essex County. In addition to the amazing food, the dining room and patios offer 360° views of the vineyard, Lake Erie, and the lavender garden. Did I mention the wine is amazing too? Nestled in a historic century-old building in downtown Chatham is Chilled Cork. As you walk in you’ll see exposed brick walls, iconic pop-culture pieces, and original modern art all collected by the owner on his travels. 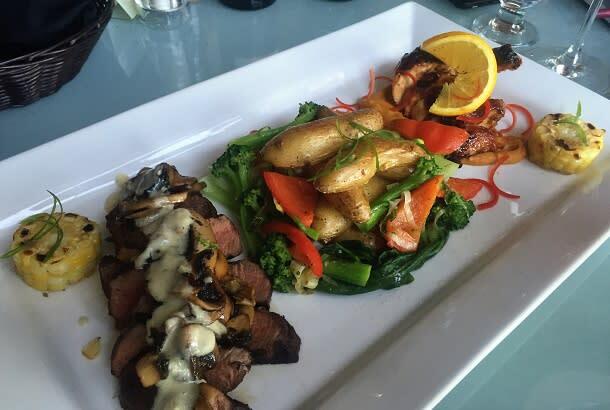 This eclectic atmosphere is all just a bonus to the amazing dishes featuring only the freshest ingredients available from Southwestern Ontario along with some of best steak and seafood available. The Perch Dinner is my favourite local dish on the menu. With Lake Erie being known for perch, you know the fish will be fresh. 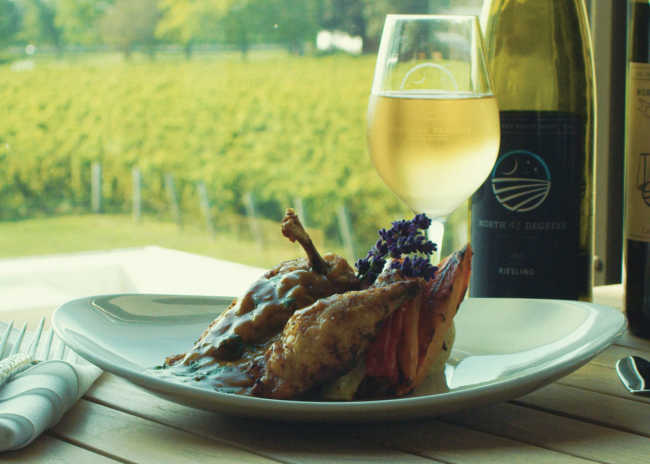 In the charming lakeside village of Port Stanley, Solo on Main and its owner/chef, Lauren “Lo” Vandixhoorn, is committed to using the fresh bounty of the area’s farms and food producers to craft the dishes on the menu. 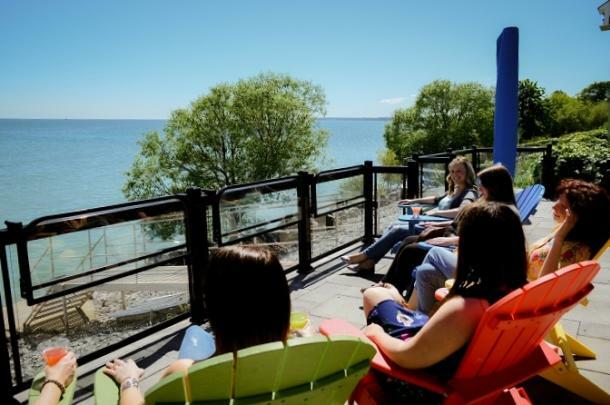 You’ll savour the all house-made ingredients of every dish while you enjoy the lake breezes coming off the water on the wrap-around porch at the restaurant. If you make it here for lunch, my absolute favourite thing to order is the "Sloppy Lo" fried chicken burger. The drizzle of local honey definitely gives it a tasty twist. The family run orchards of Twin Pines produces over one million pounds of apples each year from 35 varieties and turn them into amazing apple products and award winning ciders. What really sets Twin Pines apart is that they do every part of making a cider. They grow the apples, press them, ferment the juices, and bottle the finished product. When you take a bottle, or many like in my case, it’s the first time those apples are leaving the farm. Isn’t that amazing? London has an awesome culinary scene with great restaurants and a booming craft beer scene. The one thing London didn’t have until recently was a Feast On certified restaurant. That all changed when Craft Farmacy opened its doors in late 2017. A Feast On certification means that a restaurant has made a commitment to sourcing Ontario grown and made items. At Craft Farmacy, local is the word of the day - everyday. No matter what you pick from the menu full of rustic style food and sharing plates, you’ll savour local flavours! In downtown Strathroy, steps from the brand new Rusty Wrench Brewing Co. is the lovely Tia’s Place. 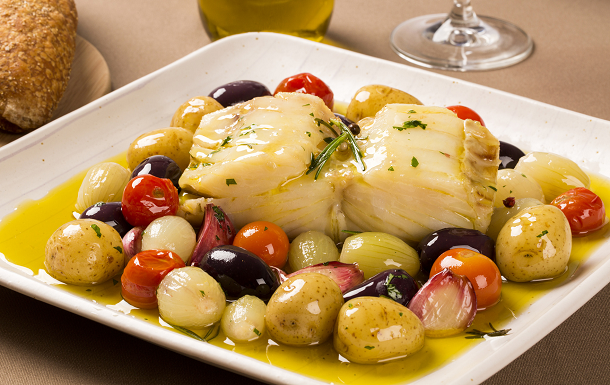 Offering diners a chance to enjoy an authentic Portuguese dining experience, Chef JJ and owner MJ, use fresh seasonal ingredients to craft their menus. Dishes feature incredible local produce and all meats and fish are butchered and prepared on-site every day. Head to Strathroy and try this fantastic restaurant for yourself. Wood-fired pizza is one of my favourite foods and when you combine it with craft beer, you can guarantee I’ll be there with both hands full. 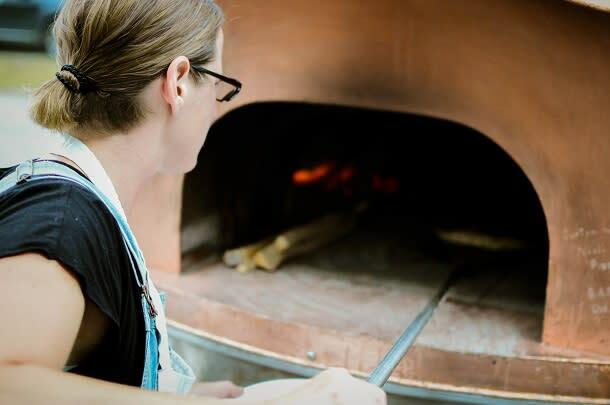 Elgin Harvest in St. Thomas is not a brick and mortar location, at least not yet; instead it’s a mobile pop-up business that sets up their wood-fired pizza oven at local spots. You can now find them every Friday evening at Railway City Brewing. The seasonally-inspired, organic sourdough crust pizzas topped with farm fresh and locally sourced ingredients are made right on-site and served along with amazing craft brews. If you can’t make it to the brewery, you’ll find Elgin Harvest on Saturdays at the Horton Farmers&apos; Market all season. Craft beer is my beverage of choice. From refreshing wheat beers in the summer to warming stouts in the winter, I love the flavours of local craft beers. At Upper Thames Brewing in Woodstock, you’ll find amazing small batch, unfiltered brews made with high-quality local ingredients and without preservatives. One of my favourites of theirs is a chocolate stout called Come to the Dark Side, made with cacao nibs sourced from Woodstock chocolatiers, Habitual Chocolate. The beer is so good that local cheesemaker Gunn’s Hill soaks one of their cheeses in it to create their Dark Side of the Moo swiss cheese! 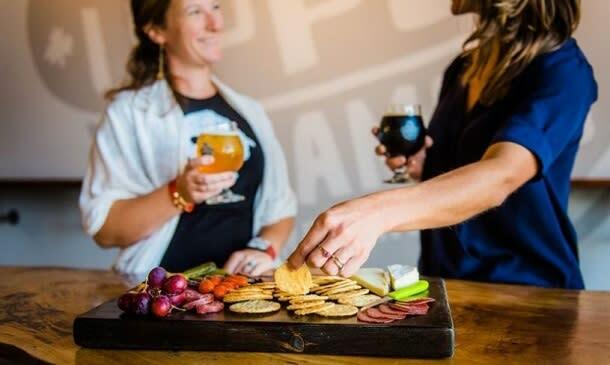 Speaking of cheese, the brewery is on the Oxford County Cheese Trail as well and offers charcuterie boards with local cheeses right at the brewery! Norfolk County is known as Ontario’s Garden and an amazing source of fresh local ingredients for any restaurant. David’s Restaurant supports the local farming community by sourcing ingredients, from herbs to proteins, from local producers. The results are amazing dishes full of flavour where you can taste the freshness in each bite. Did I mention that David’s overlooks the waters of Lake Erie? So, in addition to fabulous foods, you’ll be treated to amazing views too! Located in the charming community of Dunnville is a hidden gem in Haldimand County, DEBB&apos;S Cuisine on Queen. 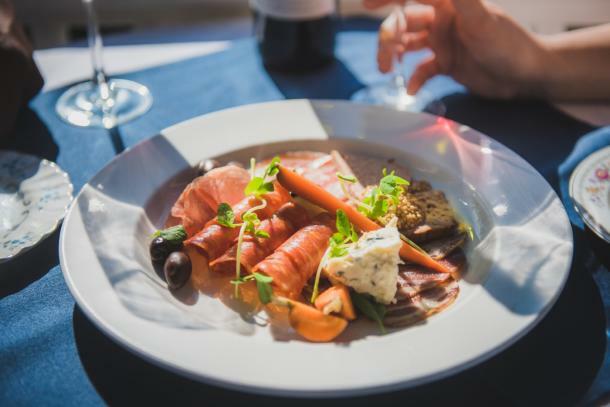 By combining the freshest local ingredients, creative approach and meticulous presentation, owner Debb & Chef Debb Davies adds a pleasurable dimension to each and every meal. 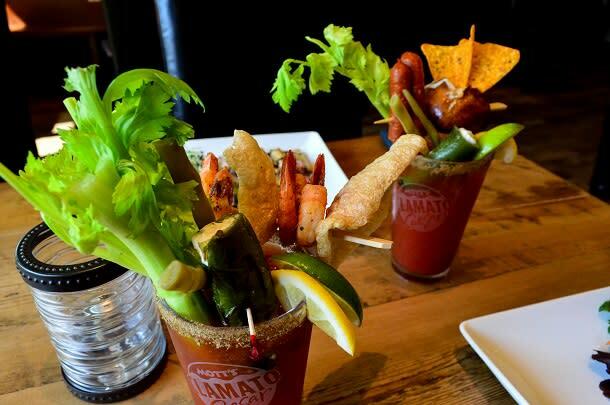 One of the most incredible things on the menu are the caesars. - they are a sight to be seen and then tasted. The unique creations are a meal on their own with some featuring pork rinds, shrimp and a jalapeno popper and another featuring chips in a baked potato with pepperettes! Doesn’t that sound awesome? Have I got your mouth watering after all that? I know mine is all over again from writing it. Time to hop in the car and head out to taste all of this local goodness across Ontario’s Southwest!